Having worked mostly in the private sector, one of the differences I’ve encountered with my position at Home Office Digital is the variety of tasks I’ve been able to work on and the level of responsibility I’ve been entrusted with from the start. I’ve already been involved in two full-scale projects, both creating internal digital tools to help users in government do their jobs effectively. One involves providing people with temporary accommodation while they prepare to leave the country, and the other is helping to resettle people who are seeking to build a better life in the UK. In the private sector, I worked with other designers and developers, and contributed to campaigns that were measured for profit. However, at Home Office Digital I work within a multi-disciplinary team comprising user researchers, content designers, developers and delivery, product and service managers, where we meticulously research our users’ needs, test ideas that address those needs, and iterate. Users and stakeholders are involved throughout the process, helping us deliver successful transactional services. Along with these larger projects, I’m also learning more about accessible design through making things like our presentation materials accessible for everyone. Are the font sizes legible? Are the colour contrasts okay? Is the content easy to understand? 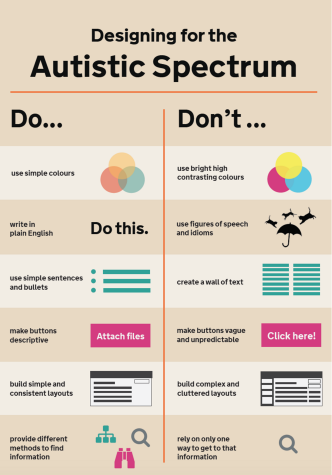 In addition, I get to create informative design posters, such as the one below, and participate in learning BSL (British Sign Language) as part of my continuous learning of access needs and inclusivity. Another difference I’ve found is how willing Home Office Digital is to help you improve your skills. Home Office Digital has already funded a front-end web development course to help improve my skills. This has been great for me, but also great for the business. When I was in the private sector, I used to work alongside a front-end developer, who’d take my designs and build them. I now have the opportunity to build my own designs and layouts, cutting out this unnecessary doubling up of time. As well as putting less pressure on the front-end developers, it means I can be directly involved in going from idea to testable prototype super fast without spending too much time on back-end build. I’ve since managed to create my first working HTML prototype for one of my two projects, which I am very proud of, and I’m looking forward to using these skills more future projects. Another perk about being a civil servant designer is the meet-ups we have; from our departmental research and design meet-ups, where we find out what other teams are working on, to the cross-government get togethers where we discuss new design patterns being used in government and listen to fascinating talks from respected leaders in the design industry. I even co-presented at a cross-government design meet-up - something I never would have imagined doing a year ago. My experience working as a designer in government has been overwhelmingly positive, and my advice for anyone thinking of working for Home Office Digital is to do it! And if you’re lucky enough to work here, my further advice would be to voice your opinions - they do matter; and learn to challenge assumptions - it’s positively encouraged. Get involved with and learn as much as you can. Don’t be afraid of asking for help and help others where you can. Collaboration is what Home Office Digital is all about. The poster looks very useful - are there more for different disabilities and would you share them with people working outside government - to help spread the word about what is needed?